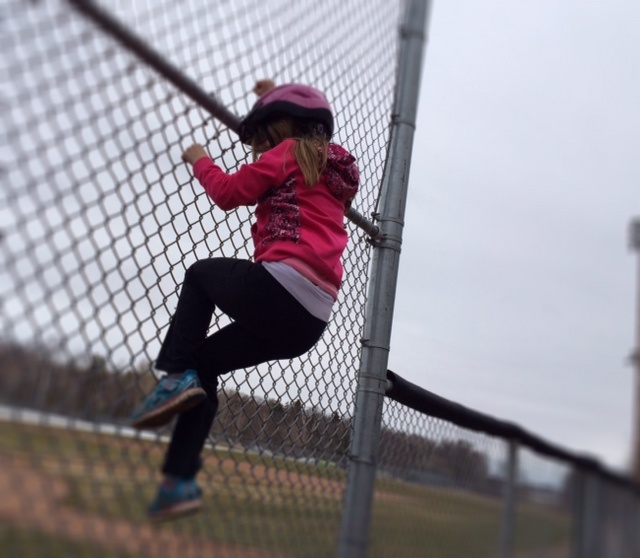 This winter when the raging nor’easters brought blizzards galore, the snow piled and piled and piled up in the softball diamond beside my house, until my eight year old daughter, Leila, could skip right over them with a crouch and a roll. There was something about that small taste of freedom that ignited a spark in her. She’s been asking more than usual to visit the park, and it’s not because she’s interested in walking the german shepherd, or even playing much with the baby. Why is Lei so desperate to get to the park these days? “Let her go,” a small voice inside me says. I swallow hard when i think of her as the babe i nursed and care for, a few short years ago, holding her hand through a precocious toddlerhood, the difficult entry into the school system, and all that’s followed since. It was fine in the winter. First it was only the top three feet of the fence exposed, plenty of snow underfoot to cushion a little girl’s fall. Then four five, then five. Over and over. Finally six, and the snow’s melted away altogether. And still, she climbs. Behind the umpire, a thirty foot fence stands mighty and tall. She jumps up and on it like a cat now, hooking her paws through the wire openings and curling her body up to meet the tenth foot, silent, before i’ve noticed. “Come on, Mom,” she says, her eyes squinting in the sun, her body twisting and flexing. Ari looks on from his perch in the carrier, his head slung back and toward her as i march on behind the dog. Ting! The wire reverberates as she she jumps six feet down, landing on the soft ground. “Ari!” I call from the bottom of the stairs. It’s too late. He’s halfway up. He may know the way up, delighted in the badland fringes of mommy’s tolerance, but the little goose, he sure doesn’t know the way down. He won’t attempt the backwards crawl back down, his arms outstretched in need of safety, comfort, and warm hugs. The small blue eyes that cry, hold me, pick me up and take me away from this scary place. The spring changes us. It invites to fly to places unknown, take steps in new directions that we didn’t anticipate. Mom moves through her MFA, Dad finishes the school year. Lawns become new with the green of life, marriages become refreshed again with the sun that hits our faces. New energy brings new solutions to last fall and winter’s problems. And everyone in the family climbs.